Quiz: Name that cruise line! 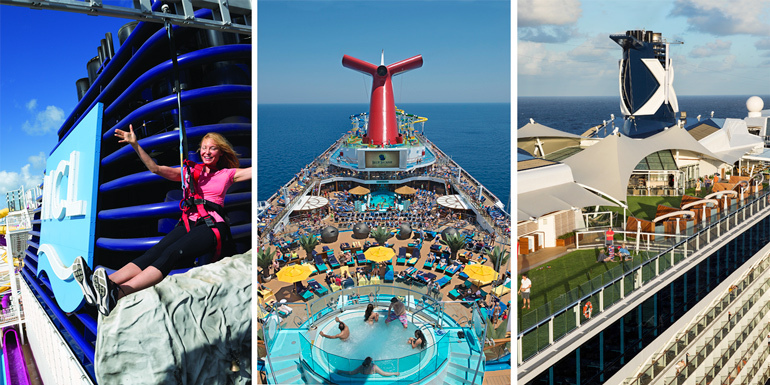 Consider yourself a well-traveled cruiser who has tried a bit of what every cruise line has to offer? Prove your diverse knowledge by identifying these well-known locations and activities on the most popular lines in the world. 1. Guy Fieri’s burger restaurant found a home on this line in 2011. 2. This line is the only line to have real grass on its ships. 3. While many of their competitors have copied this line’s rock wall, no one has copied their iconic surfing and bodyboarding simulator. 4. This line is known for their elaborate hull art. 5. Private islands are all the rage right now. Can you tell which line this island belongs to? 7. It’s nothing like the real Central Park, but this line has an open-air “neighborhood” named after the New York City landmark. 8. Where can you find this outdoor space where cruisers enjoy their evening meal with a view as they sail out of port? 9. This secluded, adults-only spot is the perfect hideaway when you’re on this line. 14. Not content to add a regular water slide to its ships, this line introduced the world’s only “aqua coaster”. Number 6 has two answers. The passengers plays volleyball with the crew. Hmm... got 2 wrong. Darn.